Recently I watched a former colleague struggle with how to show up for her team at work. Her organization had gone through a merger and a few “restructures” – people had been let go and although the team was functioning, it was, in many ways, reeling internally. My colleague was unsure of how to reach out to her team, how to lead them, and what to say…or whether or not it was really necessary to say anything at all. So she did nothing. The team seemed to be fine and, she figured, better to leave disgruntled feelings alone. Besides, they were all “lucky” to still have their jobs, and there was work to be done. The company didn’t pay them to mourn – there was no time. She did feel for the people who had been let go, and she was concerned about the morale of the team and how the team members were doing, but it just seemed easier to let things pass. Then she received some feedback from her team (that’s when she called me). It appears that while they used to trust her and feel connected to her and to the organization, they now had issues with her leadership and questioned her support. They weren’t sure she really cared – about the people who had left and also about those who were left behind to pick up the pieces. Because she hadn’t done anything, they doubted her leadership and her humanness. While we believe very strongly in the power of thoughts and intention, the world, in many ways, revolves around what we actually do. So often we “mean well” and yet cause pain to others. Or we really, really want to do something about a situation that we find upsetting or sad, but we’re too busy to actually do anything about it. Or we simply don’t find (or make) the time to actually show others how much we appreciate them or value what they do. Life goes by, and inside us are wonderful thoughts, sentiments, and intentions, but other people only see our behavior, what we actually do. There are times when it’s important to simply take an action or make a gesture that encapsulates our sentiments – so that others can see, hear, touch, and actually sense what our sentiments are. So that we can make a real difference. Where in your life are you not doing something that “needs” to be done? Take one small action today that actualizes your sentiments. Tell somehow how you feel. Do something about the things that bother you. 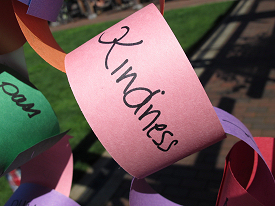 Take one small act of kindness and make someone else’s day. How has one single lovely action made a difference for you? For support in doing what needs to be done, contact Lisa at lkohn@chatsworthconsulting.com.